The German index is set gap up over 150 points at the open today after the US and Chinese presidents agreed to a temporary truce in the clash between the world's two largest economies. US President Donald Trump promised to suspend new tariffs on Chinese products, meaning that no additional tariffs will be imposed after January 1. China on the other hand will increase its purchase of American farm produce, energy and some industrial goods so as to reduce the trade deficit between the two countries. The German DAX dropped 0.4% on Friday. Looking ahead to the rest to the day, we have the manufacturing PMI from the eurozone and from Germany today. The market is gaping-up 150 points today, opening above the technical resistance level now turning support at 11415. The failure to close back below the 11415 level could increase that levels' importance as support going forward. 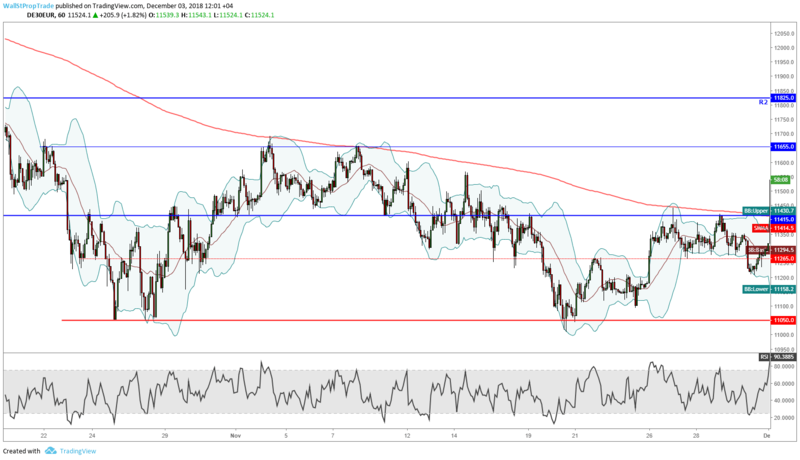 The RSI however is now signaling extreme overbought conditions and this might slow down the strengths in the short-term and trigger some profit taking action.